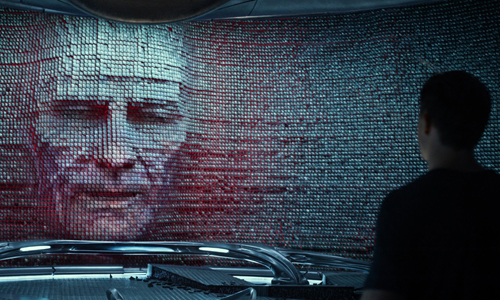 There's a clear breaking point in Power Rangers that morphs Saban's cinematic reboot of the superhero franchise from a disposable, yet tolerable nostalgic throwback into an obnoxious product that takes one straight out of its shallow escapism. It's not in how the power-suit-wearing heroes have been retooled from their previous versions, which, while playing it safe, hits the right color-coded notes with the teenager's names, roundabout styles, and how they relate to the designated dinosaur "transformers" that they control. Nor does it come in the more dramatic introduction of the characters themselves, a shrug-worthy pack of troubled rebels discovering their new capabilities in a fashion borrowed from many other superpower origin stories. And, surprisingly, it doesn't come in the wildly reimagined take on the franchise's primary antagonist, which, to be honest, stands out as one of the blockbuster's few successes. No, Power Rangers devolves from blandly-performed, youth-geared summer afternoon entertainment to an oddly infuriating experience as soon as Krispy Kreme enters the picture. The Power Rangers brand vaulted to popularity in the mid-‘90s when Saban Entertainment reworked action footage from a Japanese sci-fi show, Super Sentai, into its own series with English-speaking actors performing the drama. Despite a fairly consistent pop-culture and merchandising presence, they haven't appeared in many big-screen showings, even though many different spinoff series involving the Rangers themselves (Turbo, Time Force, Ninja Storm, Dino Thunder, etc.) have emerged over time. 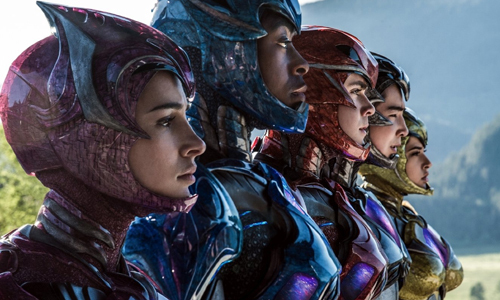 Arriving a decade after the last theatrical outing in the US, Saban's Power Rangers tells a familiar story by pulling together five high-school students -- Jason (Dacre Montgomery), Billy (RJ Cyler), Kimberly (Naomi Scott), Zack (Ludi Lin), and Trini (Becky G.) -- and granting them superhuman powers, suits of colorful armor, and mecha-dinosaur "zords" to control against larger enemies, bequeathed by Zordon (Bryan Cranston) and overseen by his helper, Alpha 5 (Bill Hader). 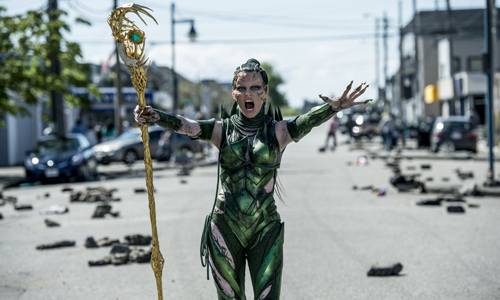 Turns out, they received their powers just in time, as the villainous Rita Repulsa (Elizabeth Banks) has broken from her eternal imprisonment to pursue a powerful crystal and to destroy the teens' hometown, Angel Grove. These Power Rangers take the plunge in a different direction than the original series, explaining and expanding upon the types of personalities of each teenager before they shoulder the responsibilities of becoming superheroes. Complete with scenes in a detention hall and a lengthy parent-child lecture inside of a car, the tone and structure of their introduction openly imitates the beginning of John Hughes' Breakfast Club, only filtered through the archetypes established throughout the Power Rangers series. Jason's the resident "jock" of the bunch, and his antics have put his professional sports career in jeopardy; Billy's the "nerd" component of their team, who has a familiarly explosive reason for being in detention; Kimberley's a popular, yet rebellious cheerleader harboring a few social secrets; and so on. These similarities are transparent, and the differences they do embody all unadventurously revert to the templates of the original characters, with a few novel touches (sexuality, autism) setting them apart. Despite this promising departure into dramatic territory, however, character innovation isn't a priority or much of a concern. As these new Power Rangers discover that they've been given extraordinary powers -- messily chosen by the will of the universe instead of by ole Zordon himself -- and start figuring out how they work, one can't help but recall countless other comic-book origin stories that have already done the same things. The jumping and wall-crawling immediately makes one think of Spider-man (either one), while their rushed training from zero fighting experience into polished and capable saviors of Angel Grove fits snugly between one of Jean-Claude Van Damme's flicks and Batman Begins. Had the John Hughes-like teenage dramatics struck a stronger, more genuine chord, this going-through-the-motions rhythm of prepping the pre-Rangers for duty might've gone unnoticed, and the story's concentration on them only being able to experience their full potential after becoming a cohesive unit almost gets there. Except for RJ Cyler's quirky turn as Billy, however, the performances lack the right amount of either substance or charisma to overlook conventions and embrace what they're progressing towards. It's becoming a bit of a trend for the most outwardly questionable elements of a superhero blockbuster to turn into some of its strongest assets when surrounded by either mediocrity or flat-out catastrophe; see Gal Gadot's Wonder Woman and Margot Robbie's Harley Quinn for immediate examples. Chalk up Elizabeth Banks' turn as Rita Repulsa as yet another of these: with glistening green plate-mail armor and strange facial protrusions, her looks bravely departs from the hokey witch apparel of the Rangers' nemesis and into something more striking. With a slight, piercing hiss and a fiendish rhythm to her voice, Banks easily becomes the most captivating element of this reboot, and her villainous turn only grows more intriguing once her character's ties to the Rangers comes into full view. Visual effects involving melting gold and bound-together rocks maneuver around her vivid armor -- which almost looks like green metal flames engulfing her body -- and psychotic facial expressions, helping this stark deviation from the Rita Repulsa of fans' nostalgia triumph over the banality of her vindictive, world-ending, yet conveniently restrained scheme. Despite any misgivings over its lack of originality and perfunctory connections to the original show, and taking this pleasant surprise of a Rita Repulsa into account, Power Rangers still functions as a kid-friendly summer spectacle with escalating stakes and a little thought put into its teenage attitude. Essentially, it plows forward as one of those unobjectionably forgettable action movies; probably not what Saban wanted after regaining the rights, but potentially a credible starting point for a franchise. Then, the name Krispy Kreme does a number on the escapist illusion being cast by the film. Look, movie-goers have grown accustomed to some degree of product placement in tentpole extravaganzas like this -- especially in Michael Bay-directed and produced blockbusters -- but Power Rangers takes the cake ... er, pastry, by incorporating the doughnut maker as a plot device late in the game. That, by itself, comes across as ridiculously unsubtle as heroes and villains toss the brand name around, but it pales in comparison to the moment when Rita Repulsa takes a breather from a race against time to stop and sink her teeth into one of the company's goodies with their familiar glowing sign radiating behind her. This ridiculousness isn't easy to forget. Essentially, Saban's Power Rangers covers the same ground as the premiere episode of the original ‘90s TV series, so there's about twenty minutes of overarching plot spread across two hours of movie here, filled out with the frustrations and victories involved with five misfits locking together into a team. A big part of what makes the franchise appointment-worthy transpires after the luscious Krispy Kreme sequence: big computer-generated effects embolden a grand battle between good and evil forces towering above Angel Grove, in which the filmmakers diligently work toward, and occasionally succeed in, evading anticipated similarities drawn to the Bayhem of the Transformers movies. Perhaps it's how this Power Rangers factors into the affable nature of the brand, its dogged and safe obligation to the triumphs of heroism, or perhaps it's the lingering aftertaste left by such blatant product placement, but all this resulting visual chaos -- persistently active but only sporadically convincing -- and action-movie vigor clunks along toward a foreseeable end without feeling like it earned the right to truly get going or appear mighty.